Okay, I admit it, I LOVE a nice sifted compost. The absence of rocks, twigs, leaves etc. make the virgin soil look perfect. I’ve had people marvel at how beautiful my planting beds look after running my compost and dirt through a screen. Yea, yeah, I know it isn’t necessary to screen compost before adding it to your garden, but the payoff is (now) worth the work. 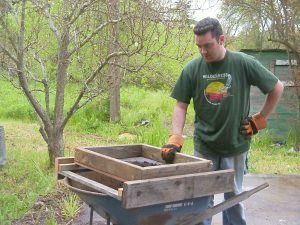 I’ve tried quite a few ways of sifting compost, but most of them require a lot of back breaking lifting and shaking. Well, following an idea I got on the interwebs I modified the plans and made an incredible compost sifting device. Here I am breaking my back. It doesn’t look like very much fun does it. And here I am with my new sifting device. Boy is this MUCH easier than before! If I could just find a way to get past the shoveling of material into the screen and from the wheelbarrow I’d be home free. Here’s the screen I’m using. 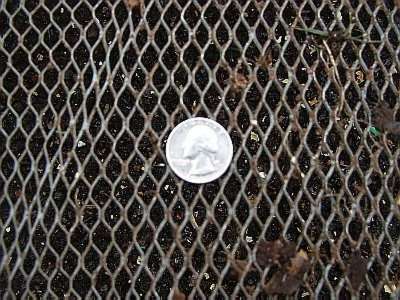 My dad calls it “expanded metal lath”. It is pretty small, but it was what was available around the house. Lots of work, but great lookin’ dirt. Biggest problem (besides the time) is that the worms don’t pass through so well. The main changes I made to the design here was the change to the dimensions to fit perfectly lengthwise on my wheelbarrow and a lip that would keep it snug on the top of the wheelbarrow. Future versions may include a feature that will provide for easy dumping of the left over compost / dirt into another wheelbarrow. 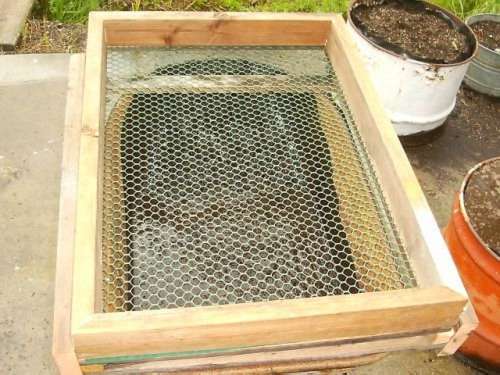 I’m also going to make another screen with larger holes to filter compost that I’m not as worried about it looking perfect. I’m thinking about adding a system that will allow me to tip the top portion over the front of the wheelbarrow to easily dump out the non-screened material. I’m also playing with the idea of “attachments” that will allow “hot swapping” of the screen size, but there may not be any reason to do that if one size fits all. I’ll get some more plans / pictures posted once it stops raining. Here is the second version. I used some pvc chicken netting. I was worried about it being strong enough, but it seems to be holding up pretty well. I made this one quite a bit bigger than the other one. The good news is that it can sift a LOT of stuff. Bad news is that it is heavyer to haul around and dump. In the backyard I went to our leaf pile where we’ve been dumping leaves for years. 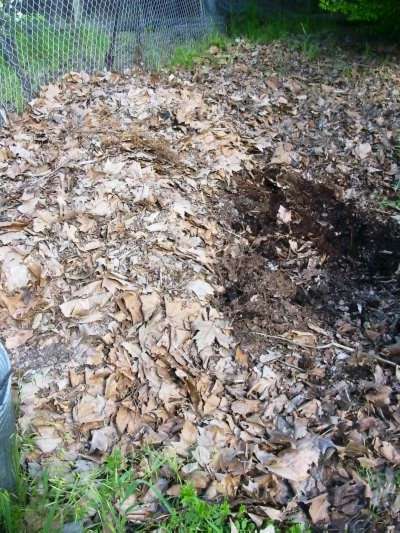 Under about a foot of leaves is some stuff that looks like it is completely composted. I took my new sifter out there and filled up the wheelbarrow in a few minutes. All the leaves, twigs, roots, etc. were out in a jiffy. Great Idea. I like the welded wire, or hardware cloth as people sometimes call it around these parts. It holds up really well. I’ve had one sifter of 1/2 inch hardware cloth for over 20 years and no rust. I will sometimes put a support bar underneath to keep the wire from sagging and tearing free. Not because it would if I’m using it, but because helpers are not always aware of things like that and will push on them etc… The hardware cloth comes in everything from 1″ down to 1/8″ and I have screens in all sizes plus two finer screens for sifting anything from compost to dirt, clay, sand, etc… My design is different, but could be adapted to your sled/cradle thing. thanks for the cool idea. This link still no longer works. This is my home made and I can shake it in all directions. 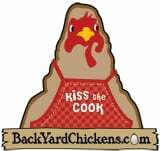 I love your compost sifter/slider! I too found the holes just a little smaller than i wanted. Discovered that the lath is very weak and it is easy to stick a really big screw driver through some of the hole, wriggle it around, and widen them. Do as few or many as you want.